Massage Therapy Overland Park: Injured at Work? How Chiropractic & Massage Can Help! In 2014, there were 2.8 million occupational injuries. These injuries crossed all industries, but 75 percent were in those that provided a service. These injuries can lead to time lost at work, a decrease in production, depression, and temporary (or permanent) disability. These injuries can be caused by slip and fall, vehicle collisions, electrocution, struck by hazards, and caught in or between accidents. 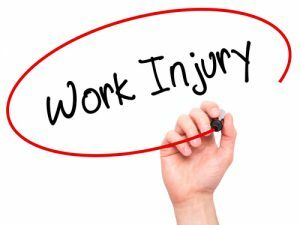 However, work-related injury can also be caused by sitting at a desk or hunched over a computer for extended periods of time. Chiropractic and massage therapy have been shown to help workers who have been injured on the job, so they can return to work faster. Thoracic outlet syndrome – This injury is caused by flexing the shoulder, carrying heavy loads on your shoulders, and extending your arms above shoulder height for a prolonged period of time. It is marked by swelling, pain, dull ache, weakness, or a burning sensation in the affected area. De Quervain’s disease – This injury is caused by forceful gripping and repetitive hand twisting. It is marked by pain at the thumb base. Back and neck pain – This injury can have a wide variety of causes from repetitive motion to an accident to improper equipment. It is the most common work-related injury. When doing computer work, use a footrest for support and keep your knees between a 90-degree and 120-degree angle. Overland Park Chiropractic care can help speed your recovery, improve your posture, and restore your mobility and strength. Through various chiropractic techniques, many of the occupational injuries listed here can be effectively treated. Gentle Chiropractic and Medical Massage are proven methods for managing pain for the back and neck, but it has also been proven to be very beneficial for conditions like carpal tunnel, elbow tendonitis, and knee injuries. Chiropractic’s whole body approach helps injured workers not only manage their pain and help heal their injury through adjustments, but it can also help with soft tissue rehabilitation and other noninvasive therapies that improve range of motion. In short, chiropractic care and massage therapy can help workers get back to work faster so less time is lost from work, and the financial impact is greatly decreased. If you are looking for a gentle Overland Park Chiropractor or a Medical Massage Therapist in Overland Park with over ten years in practice, give us a call at 913-681-7757 or schedule an appointment online.